This section is from the book "The Horse", by Isaac Phillips Roberts. Also available from Amazon: The horse. Some of the European governments find difficulty in securing enough suitable horses for mounting cavalry and for other army uses. Because of this shortage some governments, notably the French, have given aid and encouragement to the horse breeders, especially those who were endeavoring to produce superior animals suited to such purposes. No claim is made that these horses are thoroughbred or even pure-bred. The same may be said of the American trotter. It appears that really very good and desirable horses can be produced by uniting two good animals, though only one or neither are classed as pure-bred. They are simply Demi-Sangs, although without doubt the blood of the English thoroughbred (Orient) largely predominates. Some time during the last quarter of the eighteenth century, thoroughbred stallions were introduced into France from England. The services of these horses and the best of their get were offered at low rates to breeders of this class of stock. A bonus was granted by the Government to owners of superior stallions, on the condition that the stallions so subsidized should remain in the country for service. All stallions advertised for service had to be approved by the Government, and none but superior ones were subsidized. This Government control did not extend throughout the country; hence the breeding of horses specifically for cavalry use was confined chiefly to the departments of Orne, Calvados and Seine-Inferieure. Description. 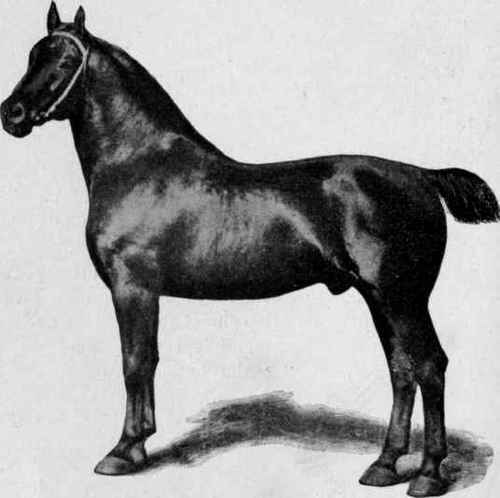 - The color of the French coach-horse may be bay, chestnut or black, though bays are far the most common and universally selected by American importers. In weight they are nearly equal to the Cleveland, though usually not quite as tall. Their average weight ranges from 1,050 to 1,250 for stallions. The head is blood-like, small, clean and expressive. The neck is only moderately long, well arched and symmetrically set on long, sloping shoulders. The back is short; hips moderately long and well up; legs of moderate length, clean, symmetrical; feet tough and well formed. The best specimens are so symmetrical, the parts so harmonious, the movement so rhythmical, that one finds little to criticize except lack of size; and it may be a question whether the size can be much increased without developing some undesirable characteristics, especially coarseness. It is quite possible that it would be better to attempt to produce a little larger coacher by coupling with large dams. The danger in this is that large dams are often coarse in make-up, and if the stallion should not be usually prepotent the outcome would be a coacher lacking in symmetry. Be this as it may, the breeders are rightly making an effort to increase the size of this horse without diminishing his courage, his symmetry, style and endurance. Fig. 15. French coach stallion Paladin, 1968. 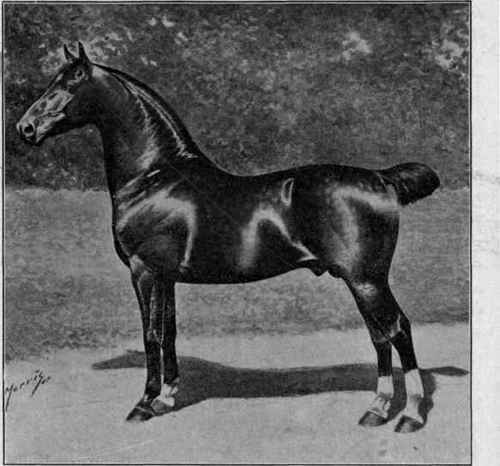 Championship winner over all coach and carriage breeds, including hackneys, German coachers, trotters, thoroughbreds and Cleveland Bays, Chicago Horse Show, 1897. Bred, owned and now in service at Oaklawn Farm, Wayne, Du Page County, Illinois. It is probable that, in time, even better material for producing a variety of American coachers than is now found in the trotter may be secured from the get of these French horses. If the attempt is ever made, it should not take many generations in skilful hands to produce a breed. Some horsemen, whose opinions have much weight, contend that the Cleveland bay and French coachers are large enough for coachers since so many streets now present smooth, well-graded surfaces, and since the art of building: strong light vehicles by using steel and wood in the most scientific combinations has been acquired, the effort should be to lighten the weight and draft of the coach rather than to increase the size of the coacher. But the fact still remains that large coachers, other things being equal, sell for more than do those of medium size. Fig. 16. Imported German coach stallion Property of J. Crouch & Son, Lafayette Stock Farm, Lafayette, Ind. By permission "Rider and Drive". No other breeds or varieties of horses other than those mentioned above have attracted wide attention as progenitors of coachers. For a more detailed discussion of coachers, consult the authors mentioned in the bibliography. The German coach, since the World's Fair held at Chicago, 1893, has had some admirers, and there are now good specimens of them in the United States. Here we have a horse which fills the requirements as to size and color. In studying them closely, I frequently heard the following remark: "They are large and fine, but they lack somewhat that springy and easy action so much admired in coachers." My own impression was that they did not possess these characteristics as fully as desired. Notwithstanding these criticisms, I confidently believe that the German coach is likely to produce a superior coacher when bred to mares of suitable size and type, that is, to those having a liberal infusion of warm blood coupled with the indescribable finish, form and action sometimes found in mares of mixed blood, not infrequently described as "good road-mares," of great endurance and efficient service anywhere except at heavy draft. The accompanying cut is that of a horse whose make-up is emphatically of the large coach type. Slightly modified to suit American tastes, this breed should find quick recognition in the large cities. For further particulars, consult German Coach Horse Stud-Book; also J. Crouch & Sons, Lafayette, Indiana.